With around 40 leading scientists heading to Splendour in the Grass in Byron Bay this weekend, there will be more than 80 hours of research themed activity presented in the inaugural Science Tent – including the Half Glass Experiment. The impressive line up includes top researchers and science communicators from across Australia who will address the science of everything from music, molluscs, sharks and coral to beards, viruses, parasites, mating and wine. During the three-day event, around 35,000 festival goers each day will have a chance to meet researchers and learn something new. They will also be invited to participate in a live, social experiment. Science Tent producers Future Crunch say that for young people these days, the glass always seems to be half empty. And yet, despite all the bad juju, Future Crunch think that young people feel more hopeful about the future than the mass media suggests. Their sneaky plan is to run the Half Glass Project, a live, guerilla-style, social science experiment to check the pulse of the nation’s youth. Data will be collected, videoed and streamed each day that you can access online via Twiter #SITG2017 @Future_Crunch. 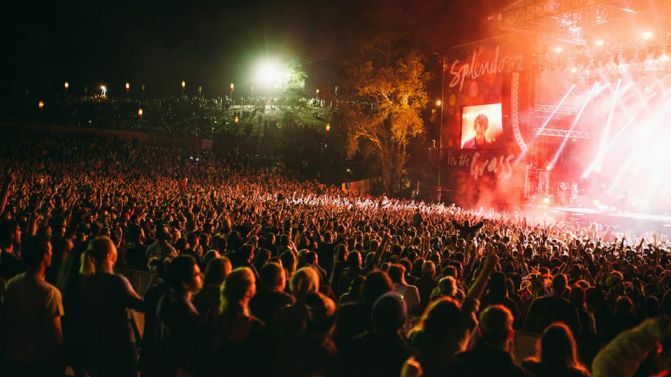 So if you or your friends are going to Splendour, come and visit the Science Tent! Be part of the experiment and help Future Crunch discover whether young people think the glass is half empty, or half full. And if you’re not, watch the results unfold online here! The Science Tent is a partnership between Inspiring Australia and Splendour in the Grass. The program is co-curated by Future Crunch, Jackie Randles from Inspiring Australia (NSW) and Kristin den Exter from Southern Cross University.